If you’ve been looking for the perfect excuse to eat doughnuts after 10 AM, the Doughnut Lounge has exactly what you’re looking for. If you've been looking for the perfect excuse to eat doughnuts after 10 AM, the Doughnut Lounge in Kansas City, Missouri has exactly what you're looking for. The Chicken Fried, for instance, is a crispy piece of fried chicken and fried jalapeños, piled atop a glazed doughnut and drizzled with honey sriracha sauce. The Glazed & Gravy, a glazed doughnut smothered in sausage gravy and topped with a soft, fried egg, is as mind-blowing as it sounds. The Doughnut Lounge's Glazed and Gravy Nodut. All photos by Chase Castor. These are just two of the so-called "Noduts" gracing the weekend menu at the Doughnut Lounge, alongside the amazing variety of classic and signature doughnuts served all week long. What exactly is a Nodut? To put it simply, it is the type of doughnut you'll need a knife, fork and quite possibly a few napkins to eat. "We really like to be able to explore and to have fun within a doughnut concept, so the fork and knife thing came naturally along with that," Doughnut Lounge general manager Jessica Teliczan told me. The original concept for the Nodut came from owner Jake Randall, but these days, coming up with new menu items is more of a team effort. "We're all about creativity and trying to encourage that in our kitchen and from our front-of-house staff," Teliczan said. "We have a lot of staff members who bring in what they already know, and we learn together and teach each other things to try to make more exciting, interesting options." Staff members aren't the only ones getting involved in creating these menus. At The Doughnut Lounge, community is a guiding principle day in and day out. It makes sense that local farmers play a role in deciding what goes on the menu. Each season, Randall, Teliczan, and their team take a look at what they are able to source locally and allow those ingredients to guide the planning for their new, seasonal menu. In the spring, D'Nachos (cornmeal doughnut bites loaded with chicken, beans, tomatillo salsa, locally sourced cheese, and hot sauce) were a popular choice for Royals fans looking for something to nosh while they watched their home team at the bar. This fall, the Sweet Potato Casserole doughnut seemed like the natural choice. Currently, Windhaven Farm, located 40 miles Northeast of Kansas City, supplies the sage breakfast sausage used in the Glazed & Gravy. 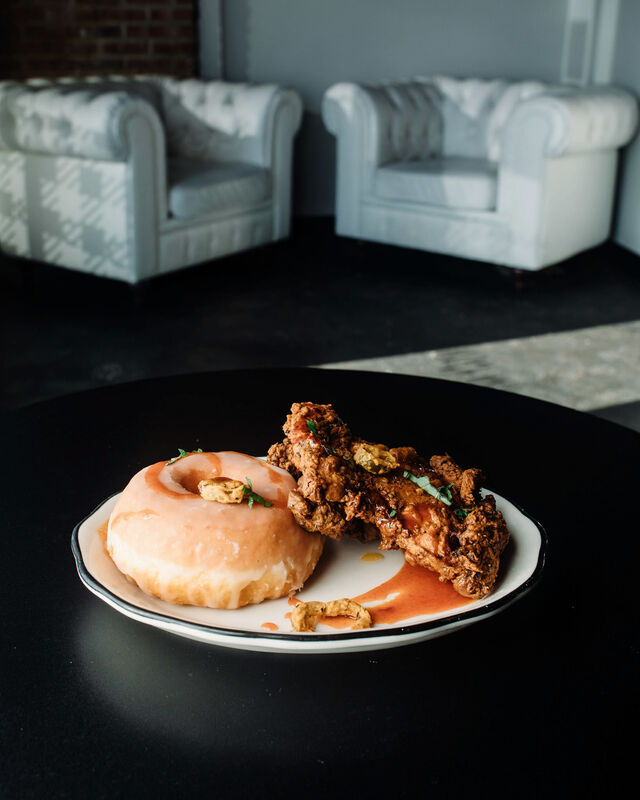 Green Dirt Farm, in Weston, Missouri, hooks them up with their eggs and the sheep's milk cheese used to create the custard in the Dolly, one of The Doughnut Lounge's signature doughnuts, topped with a root beer glaze and fresh basil. And when they're looking for fresh ideas, they just might turn to the passionate doughnut connoisseurs of Kansas City for suggestions, which is exactly where they got the idea for the popular spring and summer doughnut, the Doughnut Ice Cream Sammie. At the end of the day, whether they've been boxing up doughnuts for early morning commuters or serving them alongside their signature cocktails late into the night, the Doughnut Lounge staff always returns to their passion for connecting with the community. Whatever is left in the case at the end of the day is shared with local schools, the Ronald McDonald House, or passed out at local bars after they close up shop at 1:30 AM on the weekends. But with offerings like Hot Buttered Rum and Apple Brandy & Basil, we're having a hard time believing there is any left to share.